Explore iconic movie studios and filming locations across L.A.
Planning to tour Los Angeles’s classic movie scene? The City of Angels is the perfect destination for any fan of movies, television, and looking behind the scenes of their favorite productions. Let Champion Charter Bus handle your group’s transportation so you can relax and focus on taking in all of the fabulous sights! Call us at 310-295-9547 to get started on your group’s transportation. From historic studio tours to live television tapings to museums run by the world’s most passionate film fans, Los Angeles has it all. If you’re planning a group trip for the movie fans in your life, this is the place to be. Let Champion Charter Bus be your provider of all of your group’s transportation through Los Angeles! We’ll find a bus that’s perfect for your group, whether you need a compact minibus or a full-sized coach. You’ll also be paired with a professional driver who will make sure that your group travels safely and arrives ontime to every destination on your itinerary. Don’t stress about navigating public transportation, separating you group with rideshare services, or making some group members volunteer their own cars. With a charter bus, you’ll stay organized throughout your trip. Below, we’ve compiled L.A.’s best destinations for movie lovers. Curious to learn more about what makes Los Angeles great? Check out our 3-day L.A. itinerary for more ideas on where to visit while you’re in town! 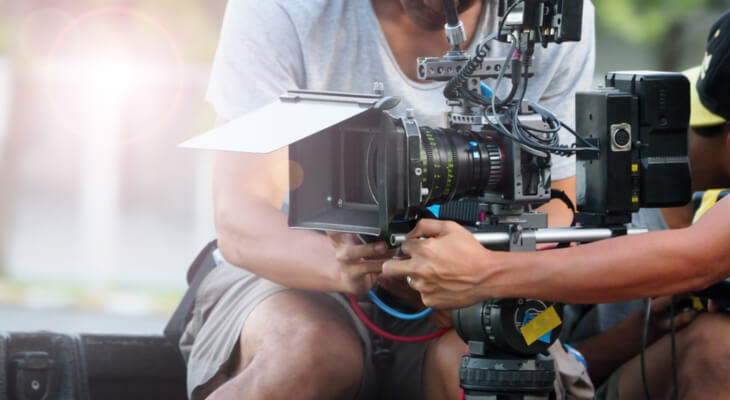 Many studios offer tours of their grounds for an inside look at what goes into producing your favorite films and TV shows. Just make sure to book your tour in advance to reserve your spot! A tour of Paramount Studios covers over 100 fascinating years of Hollywood History, including a prop warehouse and iconic lots and sound stages, as well as the opportunity to rub shoulders with those who make history at the studio every day. With a 2-hour studio tour, a VIP tour, and a special After Dark tour available for your choosing, you can enjoy the studio experience that’s most tailored to you and your group. Tour the 4-acre Universal Studios Hollywood lot with Jimmy Fallon as your video host. You’ll see the crashed Boeing 747 set from Steven Spielberg’s War of the Worlds, the shark model from Jaws, the Bates Motel from Alfred Hitchcock’s legendary psychological thriller Psycho, and more at the world’s busiest motion picture studio. Offering a variety of tour options, the Warner Bros. 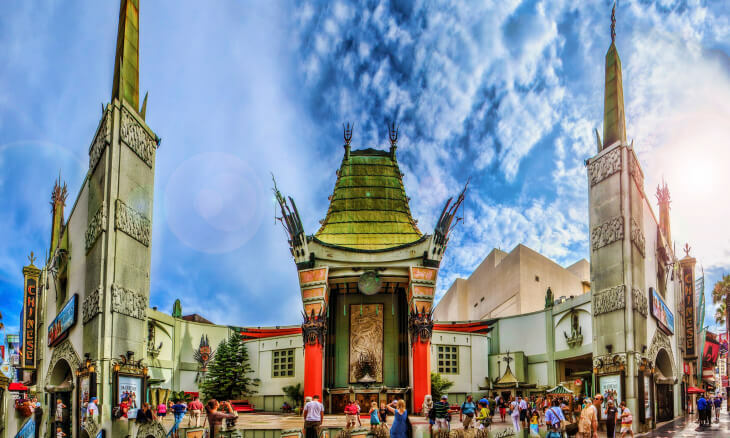 Studio Hollywood gives visitors the opportunity to tour the grounds, delve into the history of the studio’s most classic films, or spend a few hours learning about their production of horror films. A 5-hour deluxe tour (the longest offered of all Los Angeles studios) is even available for the true movie buffs of your group. The Sony studio lot is home to soundstages that once housed sets for iconic films such as The Wizard of Oz. You can also take a peek at sets for Jeopardy! or Wheel of Fortune on this two-hour tour walking tour, available to guests ages 12 and up. Below, we’ve listed a few studios and the shows that most often tape there; however, if you’re going to see a live show, the actual taping location may be different. Make sure to check your ticket and confirm the taping location before securing your bus pick-up and drop-off with us! To find out which shows will be taping when you’re in town and how to get tickets, see Visit California’s guide to seeing live shows in L.A. Attend a taping of The Late Late Show with James Corden, Real Time with Bill Maher, or the legendary game show The Price is Right at CBS Television City. 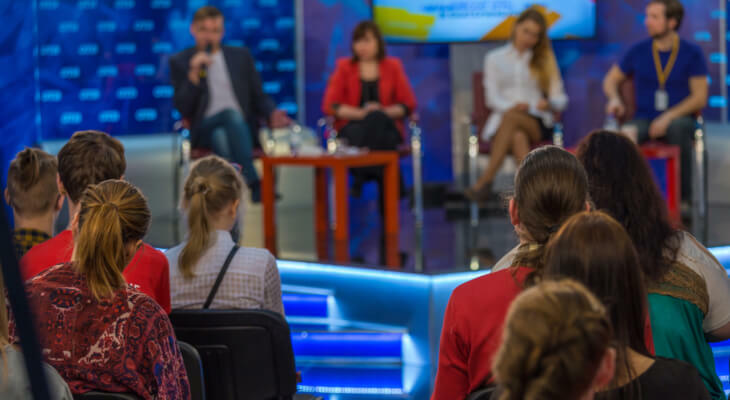 A spot at a taping is free of charge, but you’ll need to book in advance to reserve spaces for everyone in your group! Formerly known as the “Hollywood Masonic Temple,” this historic center hosts tapings for Jimmy Kimmel Live!. With a history dating back to 1922, it’s an interesting stop for the history buffs in your group as well. Head to Raleigh Studios for a taping of America’s Funniest Home Videos. Located across the street from the well-known Paramount Studios, Raleigh receives far less recognition than other Hollywood giants despite being one of the town’s oldest studios. Warner Bros. hosts tapings for Conan, The Ellen DeGeneres Show, and The Big Bang Theory. While you’re there, you can choose from a variety of lot tours offered for multiple areas of interest. Hosting grand movie premiers and high-profile events for Hollywood’s elite, these lavish theatres are a must-see for those who want to feel like they’re a part of the glamorous lives or our favorite stars. This historic movie palace, located on the Hollywood Walk of Fame, is among the most famous movie theaters in the world. The stunning architecture alone is enough to “wow” passersby, but if you wish to learn more, the theatre does offer tours 7 days a week that delve into the history of the palace from its construction to its status in the movie industry today. The Egyptian Theatre is another lavish movie palace that also holds the distinction of being the host of the first-ever Hollywood movie premier. The theatre’s design served as inspiration for multiple other movie palaces across the nation, including Peery’s Egyptian Theatre in Ogden, Utah. Schedule a tour for a behind-the-scenes look at this historic theatre. The Dolby Theatre is best known for hosting the annual Academy Awards as well as multiple movie premiers and other high-profile events throughout the year. See what shows are coming up or schedule a tour of this grand theatre. These stops will intrigue any movie buff who’s familiar with some of history’s most popular movies. Between tours of the city’s large movie studios, we recommend working in a stop to one of these quieter destinations. 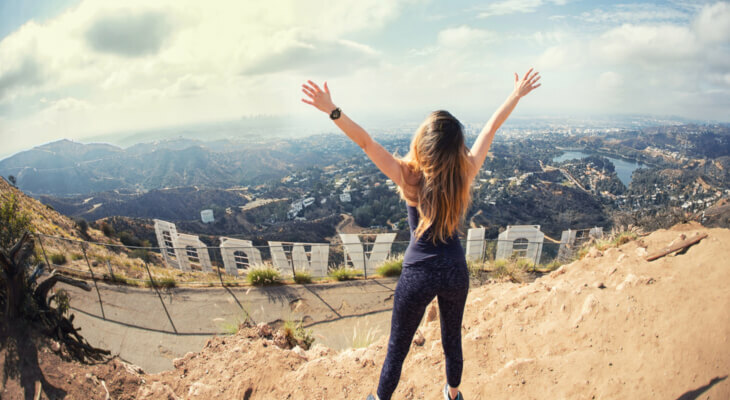 Griffith Observatory has been featured in multiple films throughout the years, including Transformers, The Terminator, and the recent hit La La Land, making it a fun destination to check off of your list. The top of the retro-futuristic observatory also offers stunning views of Los Angeles, with a few exhibitions available for curious visitors on the observatory’s lower levels. Featured in Back to the Future as Doc Brown’s house, the Gamble House is a historic home built in 1909 that now serves as an example of classic American arts-and-crafts style architecture. Tours are offered every day of the week except for Monday and Wednesday. As more than just a film museum, the Hollywood Heritage Museum has participated in efforts to restore properties related to the Hollywood environment and, since its opening in 1985, has focused on educating the public on film history and the preservation of films. With experience in transporting wedding groups, corporate travelers, families, and more, Champion Charter Bus is your #1 choice for transportation across the western United States. Whether you’re just hopping over from Beverly Hills or Long Beach or you’re planning a long-distance trip from Phoenix or Las Vegas, we’ll make sure your group always travels in complete comfort. Call our reservation specialists any time at 310-295-9547 to learn more about our services!